World Vision Lao, a non-profit Christian Humanitarian Organization, committed to working with the poor and vulnerable. World Vision (WV) was awarded a multi-million EUR grant from the European Union (EU) to lead a consortium of partners to implement their Accelerating Health Agriculture and Nutrition (AHAN) project under pillar 3 of the EU Partnership for Improved Nutrition in Lao PDR. Consortium partners include World Vision Australia (lead) with four implementing partners: World Vision Laos, Agronomes et Vétérinaires Sans Frontière (AVSF), Green Community Development Association (GCDA) and the Burnet Institute. The EU funded AHAN project covers 12 districts in the Provinces of Savannkhet, Saravan and Attapeu and has 5 key Objectives. In addition to the EU Grant, WV has secured additional ANCP funding from the Australian Government which will build on the AHAN program in Saravan Province, increasing the scope of villages and activities including a focus on Early Child Development and disability inclusion. The AHAN Saravan Project has the Overall Objective of creating supportive conditions for enhanced household (HH) nutrition through the following Outcomes: 1) Improved dietary and care practices among women of reproductive age (15-49 years) and children under 5; 2) Reduced incidence of selected water, sanitation and hygiene (WASH) related diseases/illnesses linked to undernutrition; and 3) Improved gender equitable relations at the household level, particularly in decision-making and distribution of workload. The project will be implemented across four districts in Saravan province. Formulate and implement the AHAN project M&E system to ensure the quality of the implementation of the activities in the project areas. Assist M&E Manager to develop AHAN project M&E framework and tools, based on AHAN project description, baseline, indicators and targets. Support development of annual reporting outputs for donor reports, public communication and internal use (dashboard, story maps, etc). Establish a mechanism for knowledge sharing between district offices, and WV Australia. Undertake regular field trips to target districts, conduct exercises providing support to ensure proper collection of the data and reporting system. 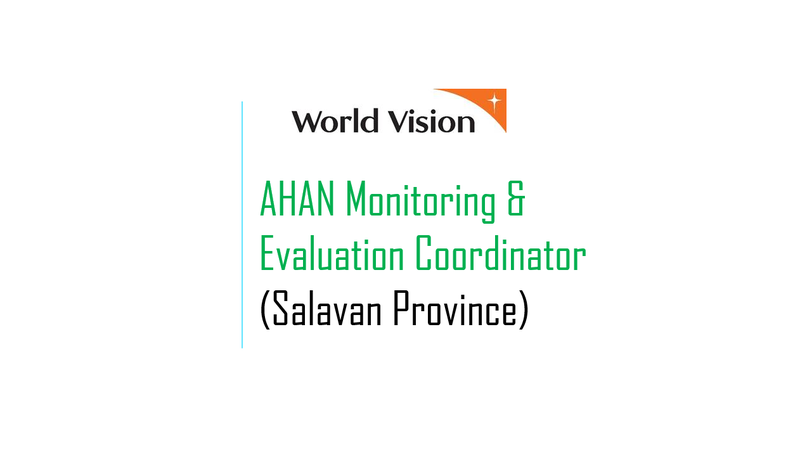 The M&E Coordinator will be based in Saravan with frequent field travel to target districts. Develop annual reporting outputs for public communication and internal use (dashboard, story maps, etc). Consistently look for more effective and efficient implementation methods and opportunities to increase impact.Facilitate learning of best practice by ensuring a continuous learning process is developed and in place with key staff and partners/sub-grantees. Establish a mechanism for knowledge sharing between district offices, and SO. Bachelor or equivalent degree of epidemiology, public health, social sciences, economics or a relevant discipline. Degree or training in monitoring & evaluation, or program/project planning. Bachelor or equivalent degree of public health, social sciences, economics or a relevant discipline. Interested candidates are invited to submit a COVER LETTER and CV to the address below. Please indicate the POSITION TITLE. Deadline for application is 21April 2019, however applicants are encouraged to apply early as applications will be reviewed on an ongoing basis and the position will close early if a suitable candidate is found.